Overall: The Amana A1RXNGFYS top freezer refrigerator was one of the BEST top freezer refrigerator models from Amana but it has been discontinued. For more information on this particular model, please continue reading down this page. This is definitely one of the more spacious top freezer models that we've come across and it's quite stylish as well. But this refrigerator's greatest asset is its capacity. With over 21 cubic feet of interior storage space a typical family of four should have no trouble fitting in everything they might need. One other feature we really liked is that it had both a FULL WIDTH storage drawer as well as two HALF-WIDTH storage drawers. Beautiful Styling: As we mentioned above, the sleek look of this top freezer refrigerator makes it a nice addition to any kitchen -- but at a really great price. 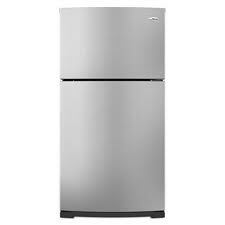 Typically in this price range, you get a very standard looking refrigerator with few, if any, notable stylish elements. But from the contoured doors to the stainless front, this fridge looks great. Cold Drinks Always Ready: One standout feature in the Amana A1RXNGFYS is the bin called a "Quench Essentials" Door Bin. It is supposed to be used specifically for either canned drinks (can hold up to 9 12-ounce cans) or a full bottle of wine (but you can use it for lots of other things if you don't drink wine or soda). Easy access to this beverage area keeps your family's favorite drinks easy to get to. Gallon Door Storage: This is one of those features that you never give much thought to until you have it. There's nothing better than being able to get large gallon sized milk containers out of your way. Well, maybe there's a few better things out there, but this is still a great feature. Reversible Door Opening: Not sure which way you need your fridge to open? Again, it's never important until you need it. But this feature is usually reserved for models that are much more expensive than this unit. A few simple adjustments and the doors can open to the left or right. Colors: This is the stainless model but it also comes in white and black for a bit less. The stainless was by far our favorite, but we were also impressed with how sleek and modern the black one looked as well. Efficiency: Although this model is not Energy Star rated, it is relatively energy efficient and shouldn't run you too much in annual operating costs. MSRP: It originally sold for $1099 though considering this model is a couple of years old and is now discontinued, you should easily be able to find it for a lot less. While we are definitely fans of this top freezer refrigerator, you probably will have a tough time finding it now. Not to worry there are many other top freezer refrigerator reviews to consider. If Amana is the brand you truly prefer, here are a few new models of their current top freezer refrigerators. Remember, start by figuring out your MUST HAVES and that should help you to narrow down your choices.